It was only a matter of time for me I guess, until the moment when I stumble upon a muddy ground, almost succumbing to its powerful force as it draws me deep into its foul maw. Maybe it was the time for me to get my feet dirty, adhering the clash between timelines while waiting for it to explode in my face. So here I am, sitting my home office, listening to the newly surfaced album of the Doomed nation BEASTMAKER, titled “Inside The Skull”, via Rise Above Records. Without a doubt, it wasn’t anywhere close to be a genuine moment for me, yet I had to find out what was all the talk about a band that is highly celebrated. When I started playing the album, I had my blow on the head after the first notes of the opener. It is true that there is a strong comeback to the 70s, mostly the flowery LED ZEPPELIN types or the Blues Rock pierced vibrations of DEEP PURPLE. Nonetheless, there is a smaller wave of the BLACK SABBATH devotees, the new recruits in the house wishing to reinstate the fuzzy grooves rhythms and the crude riffing, nostalgic soloing versus the iron toned vocals. 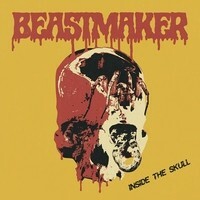 BEASTMAKER took it forward with “Inside The Skull”, tormenting with a crude sound pattern, delivering the goods with solid based riffs that some of the sounded mightier than purgatory, incinerating gloominess that fell down on its knees at their command. Surely that there are close proximities music wise to SABBATH, especially in the riff orientation, but also song structures. However, it is rapidly revealed that the beast has its own soul and essence that is slowly evolving. If you make comparisons, PENTAGRAM were a more of the same once as the British giants, yet much cleaner and much simpler than BEASTMAKER for that matter. Howling in the cold night “Now Howls The Beast” presided with intense riffing sharing a BLACK SABBATH driven lick. Even if basic, the song ruptured the mind, displaying a vocal line that is between nasal to velvet, a kind of unison that integrated well with the fuzz soaked music. “Evil One” put the first market, started out the album as strong opening pounder, 70s oriented grooves within a heavier form of the modern day creature. “Give Me A Sign” revamped “Sabbath Bloody Sabbath” all over again, deep in suspension clean-toned guitars that kept steady right before swallowed by massiveness of gloom and groove. “Psychic Visions” doesn’t leave too much room for imagination, distributed a hazed up lick followed by a groovy bass line. In general, it sounds rather close to one of the old SABBATH songs, but develops somewhat differently as quite a horrid track with doped up vibe. Self-titled “Inside The Skull” measures the totality a much nastier tone, dirtier and untamed. A heavier number to the base to the skull, featuring a well written solo section that did its wonders. When it comes to classic Doom Metal that isn’t related to the NWOBHM, there is another player in town that recaptures the same as the old SABBATH with a few clicks in and out just not to be a copied version of the former. “Inside The Skull” is the sensation that will burn through you while and after listening to this album. Check it out for your sake.